Hellman, Geoffrey and Cook, Roy T. 2018. Hilary Putnam on Logic and Mathematics. Vol. 9, Issue. , p. 51. FRENCH, ROHAN and RIPLEY, DAVID 2015. CONTRACTIONS OF NONCONTRACTIVE CONSEQUENCE RELATIONS. The Review of Symbolic Logic, Vol. 8, Issue. 03, p. 506. Young, Gareth 2015. Shrieking, Just False and Exclusion. Thought: A Journal of Philosophy, Vol. 4, Issue. 4, p. 269. BERTO, FRANCESCO 2014. ABSOLUTE CONTRADICTION, DIALETHEISM, AND REVENGE. The Review of Symbolic Logic, Vol. 7, Issue. 02, p. 193. ZARDINI, ELIA 2014. NAIVE TRUTH AND NAIVE LOGICAL PROPERTIES. The Review of Symbolic Logic, Vol. 7, Issue. 02, p. 351. Murzi, Julien 2012. On Heck's New Liar. Thought: A Journal of Philosophy, Vol. 1, Issue. 4, p. 258. 1 To give just two examples from the first couple of pages of the book: ‘None of this seems terribly attractive’ (7), ‘which I find very hard to get my head around’ (10–11). All page and section references are to Field's book, unless otherwise specified. Italics in all quotations are original. 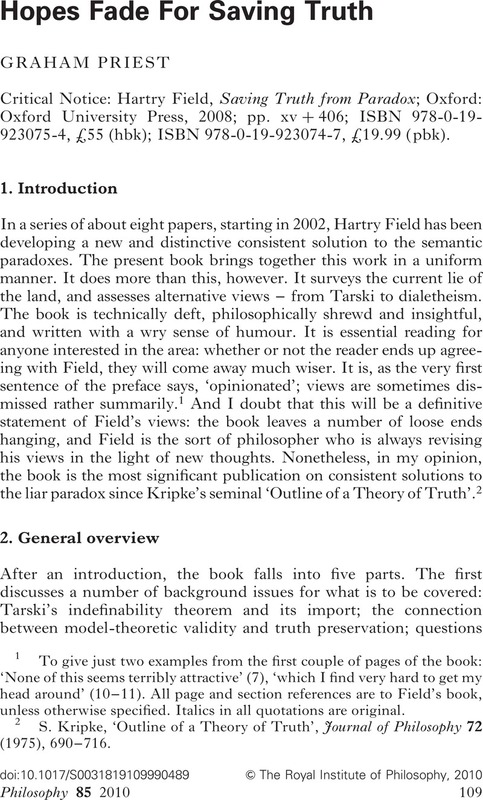 2 Kripke, S., ‘Outline of a Theory of Truth’, Journal of Philosophy 72 (1975), 690–716. 3 I use T for the truth predicate, and angle brackets for an appropriate naming device. Warning: I sometimes use notation different from Field's in the cause of simplicity. 5 See Priest, G., Introduction to Non-Classical Logic: from If to Is (Cambridge: Cambridge University Press, 2008), 7.3. 6 In fact, Field gives a definition of validity only when he reformulates the semantics as an algebraic one in the next chapter. But this is what it is. 7 See G. Priest, ‘Paraconsistent Logic’, 287–393, Vol. 6, 2nd edn. of Gabbay, D. and Guenthner, F. (eds. ), Handbook of Philosophical Logic (Dordrecht: Kluwer Academic Publishers, 2001), 5.6. 8 For DW, see Priest, Introduction to Non-Classical Logic, ch. 10. 9 Given some simple and relatively uncontentious assumptions, the latter entails the former. For suppose that (A∧(A → B)) → B. Then (A → (A∧(A → B))) → (A → B). But given A → (A → B) then A → (A∧(A → B)), since A → A. So we have A → B. 10 Brady, R., ‘The Simple Consistency of Set Theory Based on the Logic CSQ’, Notre Dame Journal of Formal Logic 24 (1983), 431–439. See Priest, ‘Paraconsistent Logic’, 8.2. Brady's proof uses a double recursion of the same kind employed by Field. As far as I know, Brady was the first person to show that it was possible to apply persistence methods of this kind to non-monotonic connectives. 11 As we shall see in due course, truth-preservation can be said in many ways. Hence the capitals to mark this particular form. 12 By which I mean C(x,y), where this refers to the sentence obtained by inserting ‘ → ’ between x and y. 13 Löb's theorem tells us that Prov〈A〉 → A is provable iff A is. 14 Here is another way to put the argument. Field rejects H; he does not believe this, and so does not know it, ¬K〈H〉; that is, H. By introspection, he knows this, so K〈H〉. 15 H. Field, ‘Is the Liar Sentence Both True and False’, 23–40 of Beall, JC and Armour-Garb, B. (eds. ), Deflationism and Paradox (Oxford: Oxford University Press, 2005). 16 G. Priest, ‘Spiking the Field Artillery’, 41–52 of Beall, JC and Armour-Garb, B. (eds. ), Deflationism and Paradox (Oxford: Oxford University Press, 2005). 17 G. Priest, ‘A Site for Sorites’, 9–23 of Beall, JC (ed. ), Liars and Heaps: New Essays on Paradox (Oxford: Oxford University Press, 2003). 18 See Priest, ‘Spiking the Field Artillery’. 19 See also the discussion, (75) of the limits of iteration of the determinacy predicate. 20 For similar reasons, Field cannot assert things which one might have expected, such as the non-existence of dialetheias, since ¬∃x(Tx∧¬Tx) is equivalent to ∀x(Tx∨¬Tx). Field has instead to deny ∃x(Tx∧¬Tx). More on denial in due course. 21 This is a version of the ‘irrationalist's paradox’. See, further, Priest, G., Doubt Truth to be a Liar (Oxford: Oxford University Press, 2006), 6.6. 22 One might also interpret Rat(A) as ‘it is rationally obligatory to accept A’. The premise then has less plausibility. It would certainly seem quite coherent to believe A, but that it is not rationally obligatory to accept A. And one might argue that it is rationally obligatory to believe that. 23 It is worth noting that the validity of 2D requires the inference A⊢B → A. This is one thing that drives Field down the irrelevant logic path. is base and utter meanness. but believe me, it shall be done. Marriage of Figaro, Act 1. 25 And as we see in a moment, the model theory, on Field's conception, cannot be invoked to explain the failure of LEM either. 26 See, further, G. Priest, ‘Spiking the Field Artillery’. 27 H. Field, ‘What is the Normative Role of Logic?’, Proceedings of the Aristotelian Society, Supplementary Volume 83:251–68. 28 Dummett, M., ‘The Justification of Deduction’, Proceedings of the British Academy 59 (1975), 201–32; reprinted as ch. 17 of Truth and Other Enigmas (London: Duckworth, 1978). See, further, G. Priest, ‘Is the Ternay R Depraved?’, a paper given at the conference Foundations of Logical Consequence, St Andrews, 2009. 29 GP: The doctrine is the indefinite extensibility of set-like entities. See the last paragraph of p. 64. 30 For more on this matter, and its connection with ‘revenge paradoxes’, see G. Priest, ‘Revenge, Field, and ZF’, ch. 9 of Beall, JC (ed. ), Revenge of the Liar: New Essays on the Paradox (Oxford: Oxford University Press, 2009). 31 G. Kreisel, ‘Informal Rigour and Completeness Proofs’, 138–171 of Lakatos, I. (ed. ), Problems in the Philosophy of Mathematics (Amsterdam: North Holland Publishing Company, 1967). 32 The matter is not entirely straightforward. Since Field takes the ground model to contain the standard model of arithmetic, of course it is not axiomatizable. The point (I take it) is that the notion of validity is not recursively enumerable with respect to an oracle that delivers the sentences true in the standard model. 33 Though he takes this to be a bad thing: ‘It would seem to be somewhat detrimental to the role of logic as a regulator of reasoning if we were unable to say that any given piece of reasoning is either valid or not valid’ (307). 34 In what follows, I will refer to my In Contradiction (Dordrecht: Martinus Nijhoff, 1987; second edn., Oxford: Oxford University Press, 2006) as IC, and my Doubt Truth to be a Liar (Oxford: Oxford University Press, 2006) as DTBL. 35 Though I do endorse it in one direction: ¬T〈A〉 → ¬A (IC, 4.7). And a dialetheist about the paradoxes certainly can accept it in both, as does Beall, JC, Spandrels of Truth (Oxford: Oxford University Press, 2009). 36 Priest, ‘Paraconsistent Logic’, 8.1, 8.2. 37 Essentially, at each successor stage, we put A in the extension of ‘T’ if it is true at the previous stage; and we put A in the anti-extension of ‘T’ if it is false at the previous stage and contains ‘ T’. Otherwise, details remain the same. 38 Field also goes on to point out that the relevant conditional is nothing like the Lewis/Stalnaker conditional, since it satisfies strengthening of the antecedent (A → C⊢(A∧B) → C), etc. The Lewis/Slalnaker conditional is a ceteris paribus conditional; and there are natural relevant versions of these, just as much as there are strict ceteris paribus conditionals. See Priest, Introduction to Non-Classical Logic, 10.7. 39 See Priest, Introduction to Non-Classical Logic, 1.9; and for a comprehensive list, Routley, R., Plumwood, V., Meyer, R. K., and Brady, R. T., Relevant Logics and their Rivals (Atascadero, CA: Ridgeview, 1982), ch. 1. 40 In fact, my preferred way of recapturing classical reasoning is not this, but uses a non-monotonic paraconsistent logic which behaves classically on consistent sets of premises. See IC, ch. 16. 41 See DTBL, p. 127 f., and for technical details, Priest, Introduction to Non-Classical Logic, chs. 9 and 10. For an account of the meaning of the much maligned ternary relation, see Priest, ‘In the Ternay R Depraved?’. 42 If provability analytically entails truth, then 1 becomes contingent upon having the right system of arithmetical proof. But as the very argument concerning G shows, beyond some means of producing self-reference, the only non-logical axiom required is 2 itself. Contesting other axioms is therefore beside the point. 43 Actually, the order of the premises is important here, so the disjunction had better have three disjuncts: ((T〈A〉∧T〈B〉) → T〈C〉)∨(T〈A〉 → (T〈B〉 → T〈C〉))∨(T〈B〉 → (T〈A → T〈C〉)). 44 As formulated in Priest, Introduction to Non-Classical Logic, ch. 10. 45 Early texts on relevant logic concerned themselves only with logical truth, not logical consequence as such. To the extent that they had such a notion, to say that B was a consequence of A was simply to say that A → B is a logical truth. From the fact that B, it certainly does not follow that ⊧A → B. 46 For what it is worth, I also have truth preservation in the form (T〈A〉∧T〈A → B〉)⊃T〈B〉, which Field does not, since this depends on LEM. 47 See IC, 20.4 for references and discussion. 48 And if you trawl through both of our papers, you may well find a speech act of denial which employs the worlds ‘indeterminate’ (for Field) or ‘false only’ (for me). The question, as with all speech acts, is less about the words used, then about what is communicated in the act. 49 See DTBL, ch. 6. In 6.3, I point out that asserting A → ⊥ cannot function as a denial in the mouth of a trivialist; nothing can. 50 See, further, IC, 20.4. JC Beall has recently stressed to me that the sentences A → ⊥ and ⊤ → A have many of the properties that the friends of consistency might expect ‘false only’ and ‘true only’ to have. 51 See Priest, Introduction to Non-Classical Logic, ch. 24. 52 See IC, 19.12, and ch. 18. There is, however, an issue of what, exactly, the set-theory is in which this is done. For a discussion see IC, ch. 18. 54 See G. Priest, ‘What's so Bad about Contradictions?’, ch. 1 of Priest, G., Beall, JC, and Armour-Garb, B. (eds. ), The Law of Non-Contradiction: New Philosophical Essays (Oxford: Oxford University Press, 2006), and the debate in many of the papers in that volume. 55 An interesting question is to what extent the consistent paracomplete theory of Brady, R., Universal Logic (Stanford, CA: CSLI Publications, 2006), based on a relevant conditional, fares any better. The account is not subject to the last three objections, but it is subject to the others. 56 This locates Field's account in the more general discussion of DTBL, 7.5. 57 This essay is based on a series of seminars given at the University of St Andrews in December 2008. Thanks go to the participants of the seminar for their thoughtful comments and criticisms, and especially to Ole Hjortland, Stephen Read, Stewart Shapiro, Crispin Wright, and Elia Zardini. Thanks also go to JC Beall and Stephen Read for written comments on an earlier draft. Especial thanks go to Hartry Field himself for extended email discussions on a number of matters dealt with here – and for many other fun discussions over the years and bottles of wine.